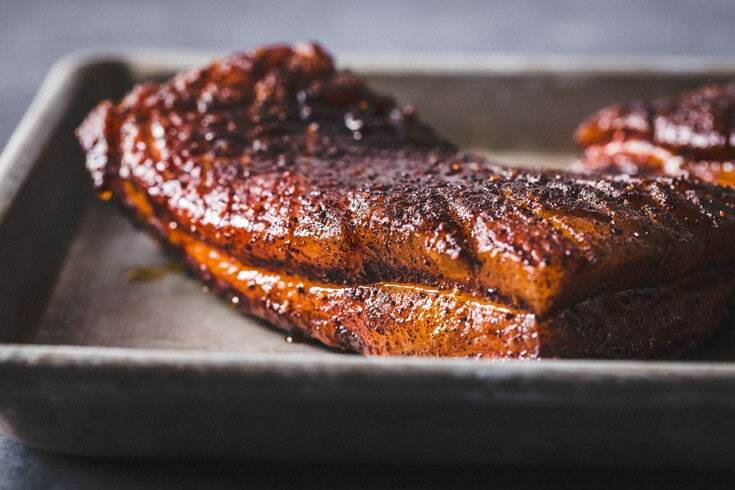 This 3-hour smoked pork belly is crave-able perfection. Smoky-sweet with a little bit of heat. Crisp it up to eat in sliders, tacos or even on a BLT salad. If you are into making a big group of people super happy, you serve them up some crispy smoked pork belly. Even people who don’t eat pork will be happy. You don’t have to do anything else. If you don’t believe me, just try it. Their eyes will light up. 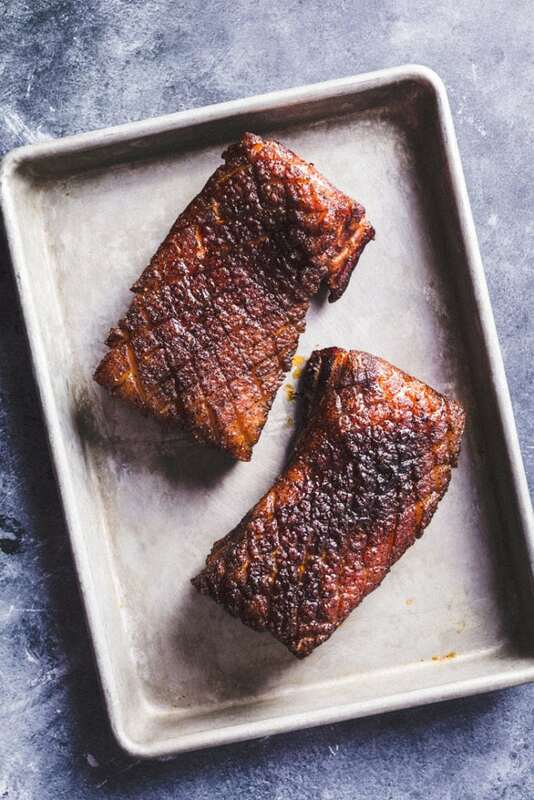 To get amazing results with pork belly; it’s really just buying high-quality meat, dry brining overnight, and then putting it in a smoky room at a specific temperature for a long time. There isn’t much else to it. The heat and smoke are doing all the work for you. 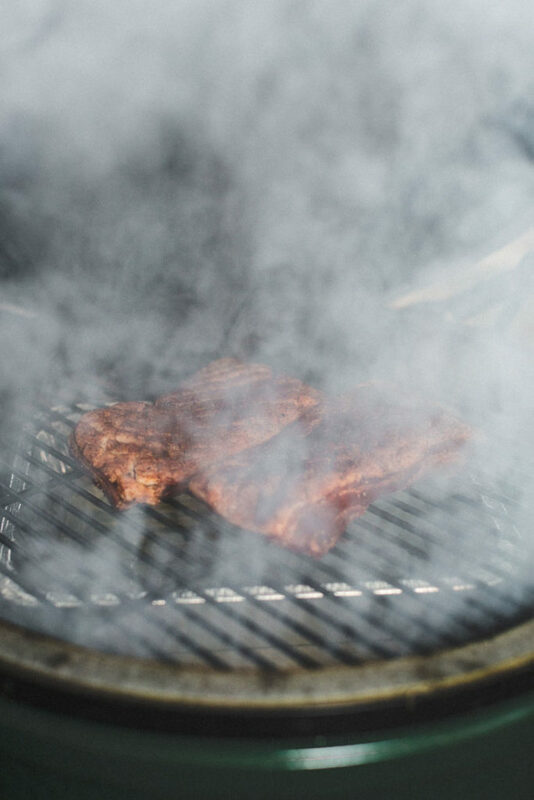 Smoking meat is really quite simple, but it can feel daunting because of the amount of time it takes and how complicated it can seem with all the temperature variations you read about. The great thing is that you aren’t really doing anything during most of the time that the meat is in the smoker but smelling the smoky air and obviously drinking your favorite cold beverage. The art of smoking comes into building the fire, choosing the right wood chips and the amount to use. That’s where the variables come in. You might like something more or less smoky than the next guy or gal. You will start to figure it out after a few tries at it. What is pork belly anyway? Pork belly is bacon’s better half. It’s actually the same thing as bacon, but it’s way better than bacon. As the name suggests, it comes from the belly of the pig and is a boneless fatty cut of meat. Most regions of the world have their own way of preparing it, but pork belly is especially popular in Asian cuisines. Pork belly is usually not a very expensive cut of meat and buying quality makes a huge difference. Your local butcher is a great place to buy pork belly or Whole Foods has great product for $5.99/lb (around here at least). That makes this recipe cost just $12 + some spices that you probably already have. 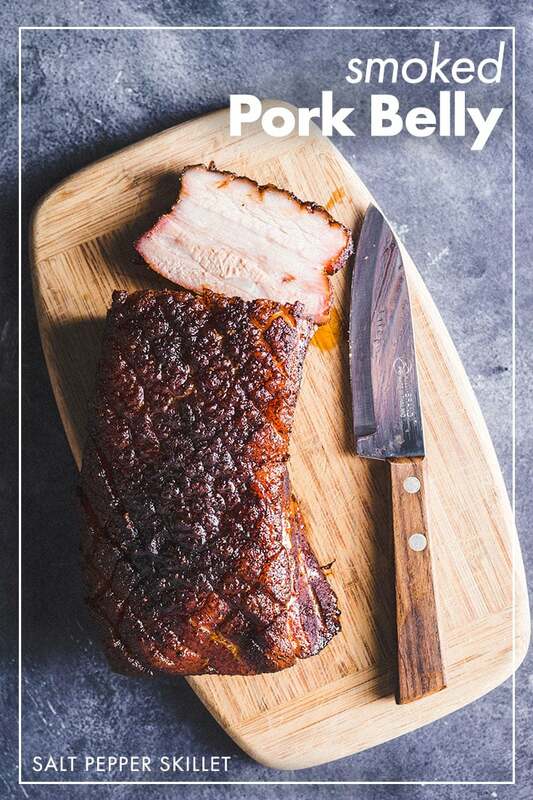 Pork belly is cooked low and slow for at least 3 hours or until the internal temperature reaches 165 degrees F, and up to 6 hours for even more tender pork belly. The longer the pork belly smokes, the more fall apart tender it gets. Sometimes you might want it slightly firmer and other times you want it to practically melt in your mouth. 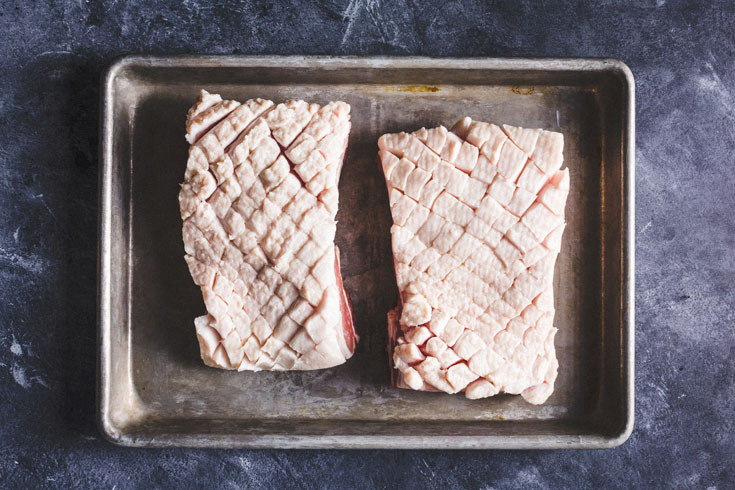 Remove the skin from pork belly (if it is still attached) and score the skin in a 1″ cross pattern. Sprinkle the dry rub over all sides rubbing it in all the nooks and crannies. Cover the pork belly with plastic wrap and refrigerate for at least 24 hours. Let the pork belly sit out to come to room temperature while you bring the smoker at 225 degrees F.
Add the wood chips and once it starts to smoke, place the pork belly in the smoker over indirect heat for 3 to 4 hours, or until it comes to an internal temperature of 165 degrees F.
Remove from the heat and let rest for 20 minutes. 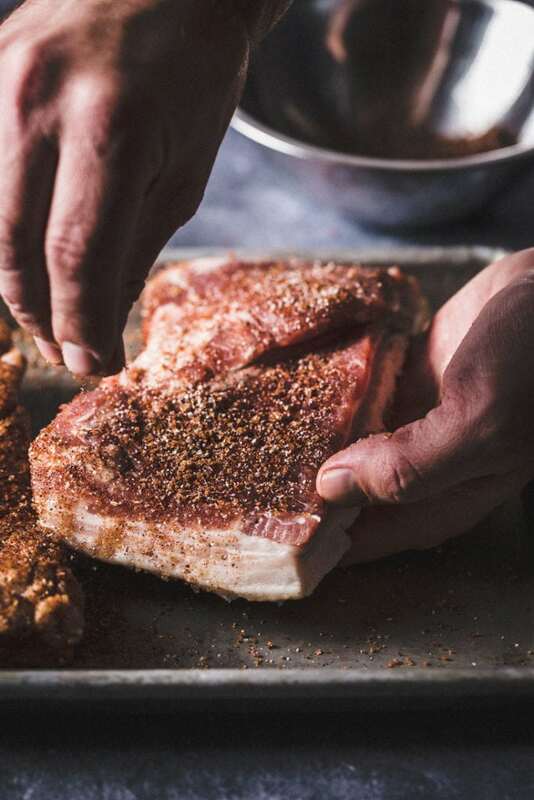 The dry rub is an essential part to enhance the flavor and tenderness. The amount of salt and sugar in the dry rub also makes it like a dry brine. Let the pork belly sit covered in the refrigerator for at least 12 hours, and preferably for 24 hours before smoking it. 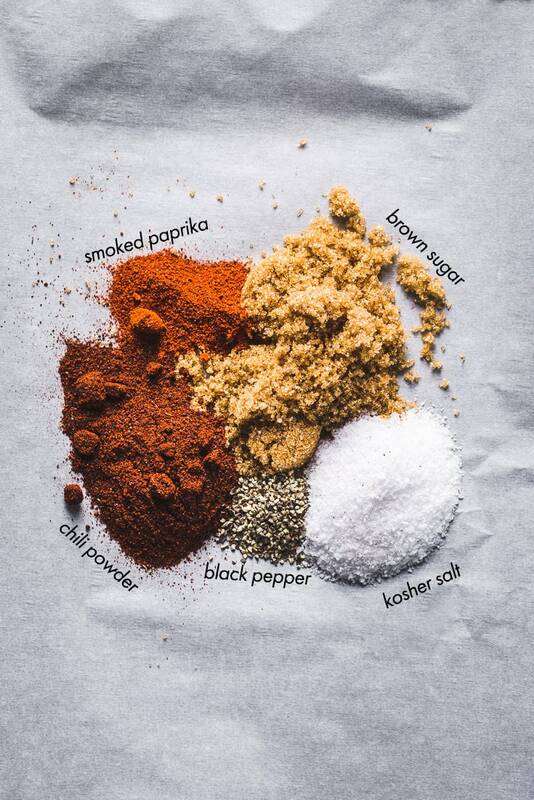 The dry rub for smoking the pork belly is made up of ingredients you probably already have in your pantry. 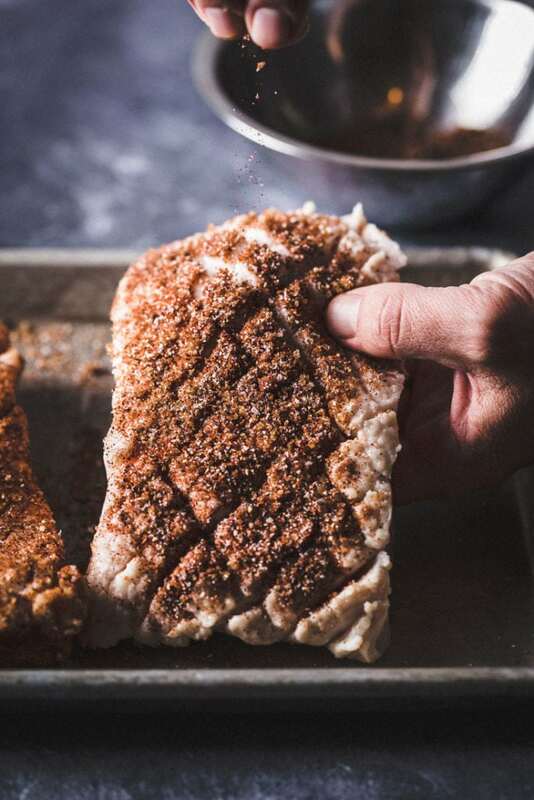 Kosher salt, sugar, black pepper, chili powder and smoked paprika are are all you need for the basic dry rub that enhances the flavor and helps to make the pork belly even more tender. Wood type for smoking often comes down to preference and there’s always a debate around it. You might not have formed your strong opinion about the subject yet, but you will after you have experiment a few times. The go-to wood chips around here for smoking is apple wood. It is subtly sweet with a milkd flavor that goes great with the pork belly. 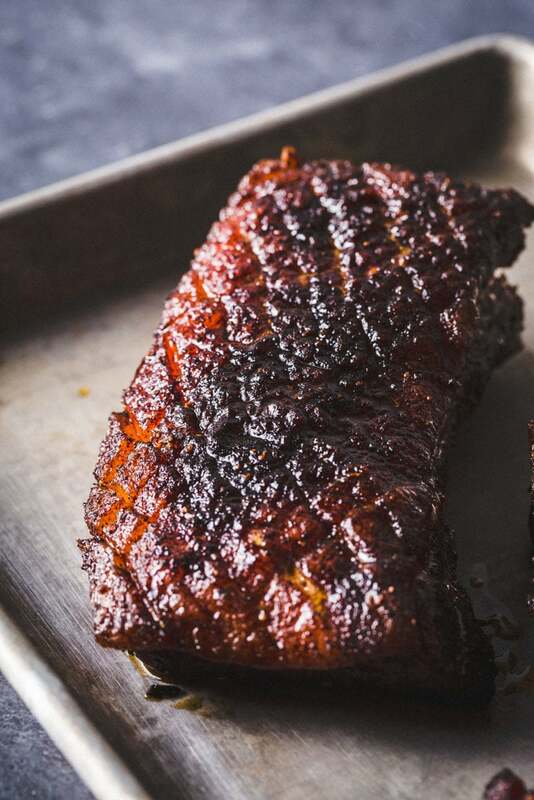 Avoid maple and mesquite for smoking pork, as they are much too strong. 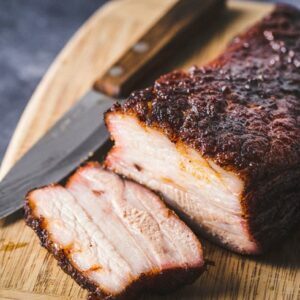 What temp is smoked pork belly done? Pork belly is ready to eat when it reaches an internal temperature of 165 degrees F, which takes about 3 to 4 hours at 225 degrees F. At that time, you can wrap the pork belly in aluminum foil or butcher paper and continue to cook it until the internal temperature reaches 200 degrees F. This will make the pork belly fall apart tender, but might not be best for every use. It’s easy to keep adding wood chips to keep the smoke going the entire time the meat is in the smoker. That can lead to an inedible piece of meat that you spent hours and hours working on. Pork belly is high in fat, and fat really takes on smoke flavor. I will usually add less wood chips for fattier pieces of meat because of how the flavors react. How do you smoke a pork belly in an electric smoker? 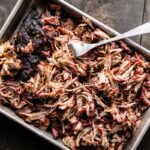 While the best flavors come from a wood/charcoal smoker, the easiest way to smoke anything is in an electric smoker, like a Masterbuilt (affiliate link). Just set the temperature to 225 degrees F with the water drip pan in place, add wood chips and place the pork belly on the rack. Set the timer for 3 to 5 hours and check the internal temperature of the pork belly then to see if it has reached 165 degrees. Add more wood chips as desired, but don’t oversmoke it. 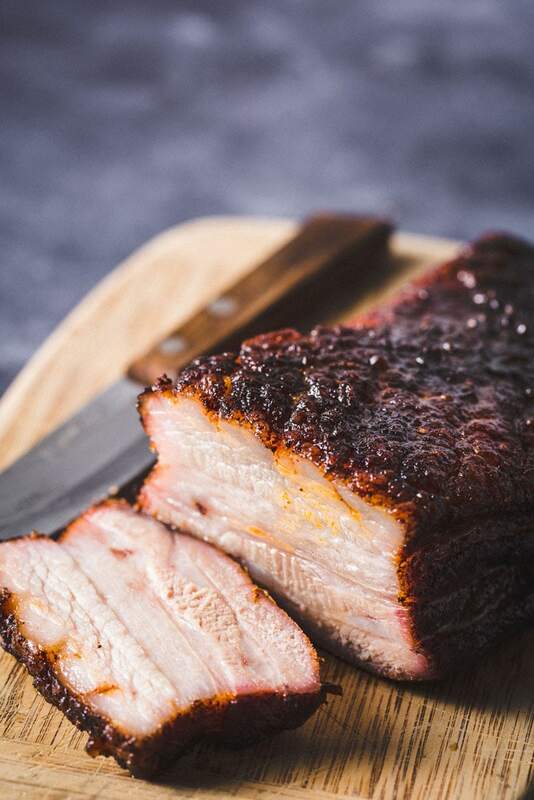 Once you have your smoked pork belly, the possibilities for enjoying it are endless. 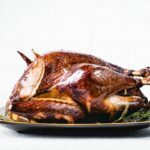 As good as it is to enjoy right out of the smoker, it can also be used to enhance so many dishes. Slice it thin and crisp it on the griddle for the ultimate bacon that is wonderfully smoky and not too salty. PB&J sandwich – A pork belly and jam sandwich? Something I’ve always wanted to try and I bet it will be amazing. Eggs and belly – dice up the pork belly and crisp in a pan with some scrambled eggs and fresh herbs. Add sliced pork belly to Ramen. 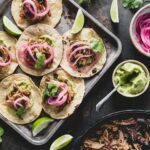 So good in Tacos with quick pickled onions. Add it to baked beans. Make pork belly sliders with BBQ or an Asian sauce. Pork belly BLT is heaven. Pork belly burnt ends are bite-size perfection. You would first cut the pork belly into 1″ cubes before smoking, and then add a sauce to finish smoking for a longer time. Crisp it up and add it to your favorite seasonal salad. Thermapen digital instant read thermometer. 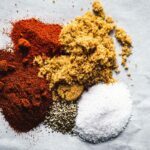 Mix all ingredients of the dry rub together in a small bowl using a fork or a whisk. Prep the pork by removing the skin (if it is still attached). Slice scores through the fat but not through the flesh with a very sharp knife to make 1″ cross-hatch throughout the whole skin. This is much easier to do when the pork belly is cold. 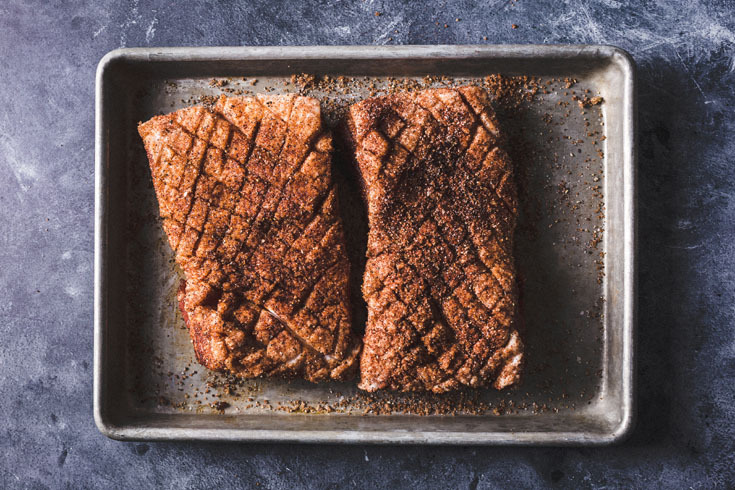 Place the pork belly on a sheet pan or baking dish and sprinkle a liberal amount rub on the belly, rubbing it into all the crevices. Cover and refrigerate for 24 hours. 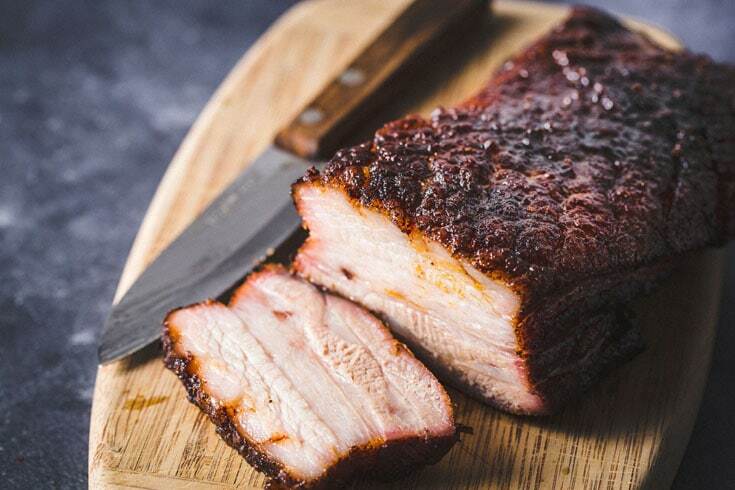 Remove the pork belly from the refrigerator at least 1 hour prior to smoking to bring it to room temperature. 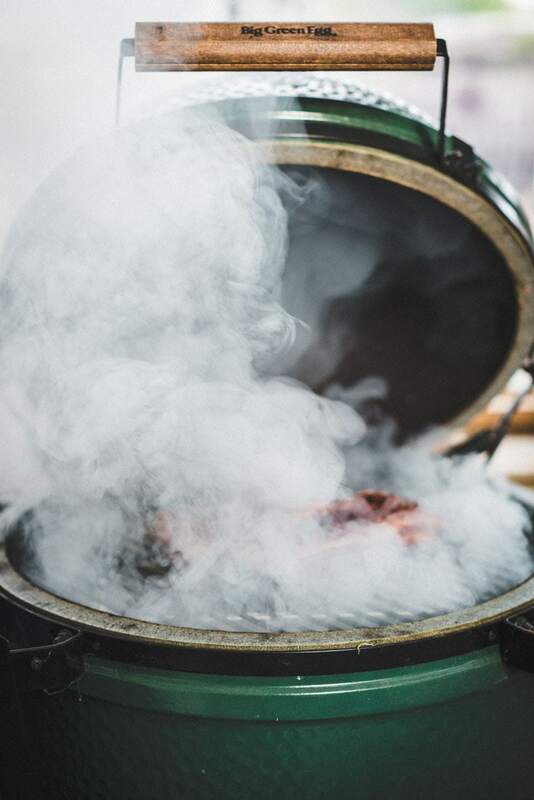 Follow your smoker’s instructions and bring the temperature up to 225 degrees Fahrenheit / 107 degrees Celsius. Add wood chips to start the smoke and place an aluminum drip pan with a few inches of water under the grates to catch drippings. Place the pork belly fat side up on the grates and smoke until it reaches an internal temperature of 165 degrees F, which will take 3 to 4 hours. Remove the pork belly from the smoker and let rest on a wire rack for at least 15 minutes. It can be sliced and eaten right away, or it can be chilled, sliced and crisped up on the grilled/pan fried for a few minutes on each side. This recipe takes two days to complete. One day to dry brine and one day to smoke the pork shoulder. Try not to open the lid until close to the 3-hour mark, unless you need to add more wood chips. The pork belly is even better the next day after it has been refrigerated overnight. We tried it and our whole family went absolutely crazy over it! Sweet, Salty, Juicey, Savory with just the right amount of spice and smokiness! Basically Melt in your mouth Happiness! Great recipe. Thank you!